On Monday mornings at 100%Open we sit down together as a team and each take just a few minutes to share our achievements, activities and alerts. These have become known as our 3As. It’s a nice and relaxed way to start the working week, that allows us to reflect on the last seven days and hear what our colleagues have been getting up to, both at work and at home. Our achievements are, more often that not, something that we have personably achieved at work that makes us feel proud. This could be meeting a client deadline, finishing a project or completing 12 months in the job. Alternatively it could be an out-of-work achievement like moving in with your girlfriend, cooking your first macaroni cheese or winning a golf tournament against a group of friends. We’re also encouraged to celebrate our colleagues’ successes – sometimes we are simply too modest to shout about them ourselves. On rarer occasions we celebrate the achievements of people we’ve never met, and Monday 7th of November was one of those days. It is an achievement I can barely get my head around. Just six months ago, when Andy was No.2 in the world, it seemed utterly unrealistic. Novak Djokovic had held the number 1 position in the world for over 2 years (120 weeks) and had a seemingly unassailable lead, with nearly double the amount of ranking points as Andy. Much to everyones surprise, Andy reeled him in, losing just 3 matches in 6 months. In October and September he won four tournaments in a row, on two continents, winning 19 matches on the bounce. On Sunday November 20th, Andy consolidated his position as World No.1 at the ATP Tour Tennis Finals in London, the last tournament of the year, beating World No. 7 Marin Cilic, World No. 5 Kei Nishikori, World No. 4 Milos Raonic and World No.3 Stan Wawrinka en route to the final, where he met World No. 2 Novak Djokovic. It was a clash of the titans, winner-takes-all encounter, where the champion would either retain or reclaim their status as World No.1. Winning on Sunday made Andy Murray only the 19th male since the computerised ranking system began in 1973 to be the year end World No.1, and I was happy to be presented with another opportunity to salute his achievements in a fresh Monday morning meeting this week. 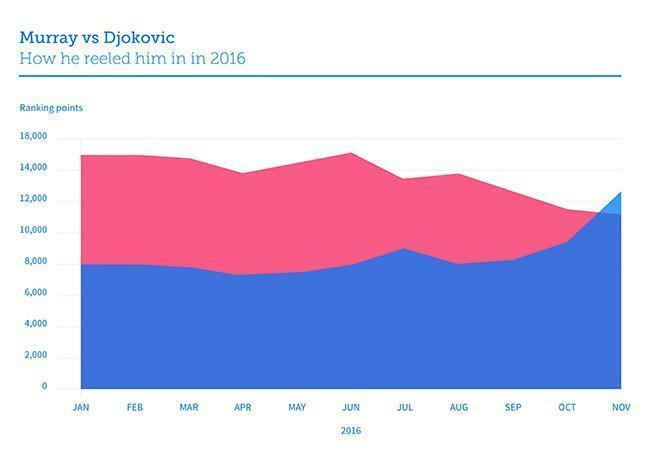 Andy’s numbers are astonishing and 2016 is crammed full of career bests. He boasts a 78-9 win-loss record, reaching 13 finals in 17 events, and winning 9 titles (including his second Wimbledon title and becoming the first tennis player ever, male or female, to defend an Olympic singles title). He hasn’t lost a match since the 18th of September, racking up 24 consecutive wins. Andy’s efforts on tour this year earned him somewhere in the tune of $13,000,000, and that’s before we even factor in what he earns through sponsorships. It begins to get all a bit too much for me to comprehend, particularly when I reflect on the fact that Andy is my age (ok, around my age) and grew up not 12 miles from me. I was tennis daft when I was young, and like Andy, I was influenced by a tennis daft mother. My mother actually recently revealed that she once considered Judy (Andy’s mum) as my new tennis coach, but decided against it on the basis that she’d be too busy with her own sons. Andy’s older brother Jamie, it should be said, also end’s 2016 as a World No.1, being as he is, one half of the World No.1 Men’s doubles pairing. I am filled with an odd but immense sense of pride that the Murray brothers hail from the same part of the world as me, despite having had absolutely nothing to do with their success. There are many more figures that I could put in this blog that celebrate Andy’s incredible rise to the pinnacle of his sport, but for me the one that follows is the most impressive, and is the real reason I decided to pen this post. 7 years and 2 months is the length of time it took from Andy first becoming World No.2 and debuting at World No.1. No one has ever taken longer. At 29 he is the oldest player to debut at No.1 for 40 years, and no one has ever had to work as hard as Andy Murray to get there. In an era dominated by three of the all-time greats (Federer, Nadal and Djokovic – they have shared 43 of the last 54 Grand Slam Tennis titles and are all still active), Andy has had to overcome much disappointment in his 11.5 years as a professional on the ATP tour. He lost his first 4 Grand Slam Finals (3 to Federer, 1 to Djokovic) and has lost 8 of his 11 Grand Slam Finals in total. At Wimbledon in 2012, carrying the weight of an expectant nation on his shoulders, who were looking for their first men’s singles champion since 1936, he lost in the final, succumbing to Roger Federer, arguably the greatest player of all time. His dream was crushed and with the disappointment still so raw, he wept on court in front of millions of people. In that moment Andy opened up to the world and let us all know how much it meant to him. Just 12 months later Andy returned to Wimbledon and became the first Briton in 77 years to win the men’s singles title. The mental toughness it requires to pick yourself up, pull yourself together and go again, after enduring such public and bruising failure, should not be underestimated. Andy’s work-ethic is unmatched and his pursuit of greatness unrelenting. In the off-season he punishes himself with a gruelling training regime in Miami, telling himself that he must work harder and demand more if he wants to realise his dreams. When his game isn’t there, he changes something. When is coaching team isn’t working for him, he mixes it up. When his body isn’t performing, he does whatever is necessary to get it firing again. Andy Murray is the ultimate innovator. He may only hit a ball over a net, but he serves as an inspiration to all of us who dream. Never give up. Never turn your back. Never say never. If you work hard, set goals, believe in yourself and fully commit, your dreams are within reach. A boy from Dunblane is the World’s No.1 male tennis player. That’s all the evidence you need. Excellent ‘reeling him in’ graphic and an inspiring story. Never give up attitude by Mr Murray. In many ways men’s singles tennis is the ultimate individual achievement. Having said that we are all standing on the shoulders of giants and Andy Murray is no different, with his mum, his brother, his various coaches over the years, notably Ivan Lendl, providing encouragement and support along the way. And I really think that when he cried at Wimbledon in 2012 that was the turning point in his career. He showed what it meant to him and he opened up to the world really and made a real emotional connection for the first time. It was clearly very difficult for him but a life time of pressure and hard work just built up and the freedom to really listen, perhaps for the first time, to the advice of others and to accept his own demons, and ultimately to be himself. Bringing that back to the day job of open innovation I think ultimately to succeed we need to figure out who we are and be true to that, as well as to build relationships with other people and that requires showing and responding to emotion in the right way. There is no doubt that it requires hard work and determination but eventually, if you keep at it like Murray has, the results will follow. In the last few months I’ve reflected on the Brexit campaign and Trump election win and in both cases I think they fired up peoples emotions and that’s what led to the success despite loosing the rational argument. Emotion trumps reason every time. Anyway I know how much your love your tennis Murray and has made it more fun for me in recent years to follow Andy Murray’s progress because of what it means for you. Terrific post Murray. No question Andy is an inspirational example of what one can achieve. When he lost Wimbledon and opened up to the world, that was pivotal. I think the key moment in his recent career that perhaps gets closer to the practice of open invitation (sharing the risk and reward with others) and one that tells us how much of a team player he is in a sport considered to be about the individual and reveals some of his core values, was his participation in Britain’s Davis Cup triumph. I may be wrong but I don’t recall any other high profile players effectively putting their own career on hold for what they see as a higher cause. It was quite a selfless act. He didn’t need to do that. I don’t think anyone would have minded, even noticed, if he hadn’t been there. But he was and helped Britain to its first Davis Cup in 79 years (making a competition format that has baffled many completely understandable and turning the Davis Cup into tennis’s Ryder Cup in the process). That is one title he couldn’t have won alone and speaks volumes. Yet for all the amazing things he’s achieved, I think his mum (and dad I’m sure, though less to go on there) is equally incredible, if not more so. What a remarkable example she is.